Security of corps members is paramount - DG - Corpr! 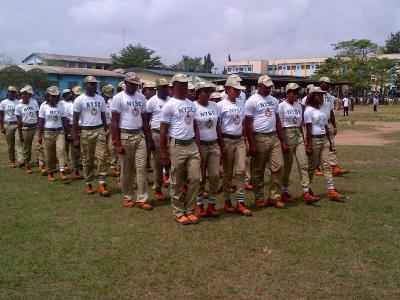 Director-General of the National Youth Service Corps (NYSC) Brigadier-General Johnson Olawumi has said that the safety of corps members is paramount, as they need to be alive, strong and healthy before they can contribute effectively to national unity and economic development in the country. Olawumi stated this at the weekend after visiting Mr. Oluwagbenga Babatunde, a corps member involved in an auto accident on his way to orientation camp and currently on admission at the University of Benin Teaching Hospital (UBTH), Benin, Edo State. Noting that national service should not be at the expense of the well-being, safety and lives of corps members, Olawumi, who admitted that national service was important, observed, however, that the lives of corps members were much more important. “In fact, it is only those who are safe, healthy and alive that can serve the country effectively”, he added. The NYSC boss was in Benin as part of his tour of NYSC orientation camps for 2014 Batch C, which opened on 4th November when he learnt about the case of Babatunde (Call-up Number: NYSC/LUT/2014/246634) who was involved in an auto accident alongside five other corps members on their way to NYSC orientation camp in Bayelsa State. While others who sustained minor injuries have since been discharged, Babatunde had to undertake surgery for fractured bone. Speaking further, Olawumi said, “I decided to come here personally to wish him quick recovery, to show that the country places a lot of value on the security and the lives of these young people and to show that we appreciate the enormous sacrifice and contributions they are making for and to the country. NYSC Member Killed By Suspected Cultist.